Business visits are very important in many companies. For this reason, in Anser Europe, we know the essential aspects to take into account in order to carry out good management of this type of trip and we have a car rental service with a driver for business trips in Marbella. Count on us for mobility in a business trip in Marbella. With our car rental service with a driver in Marbella, you can be sure that visits or business trips will flow much better, and experience backs us up as a trustworthy company, committed to punctuality and efficiency. Let our team of expert drivers take care of everything so you only have to worry about having maximum success in all your work meetings. Why rent a car with a driver for business in Marbella? You can finish elaborating the aspects of your meetings while another person drives. 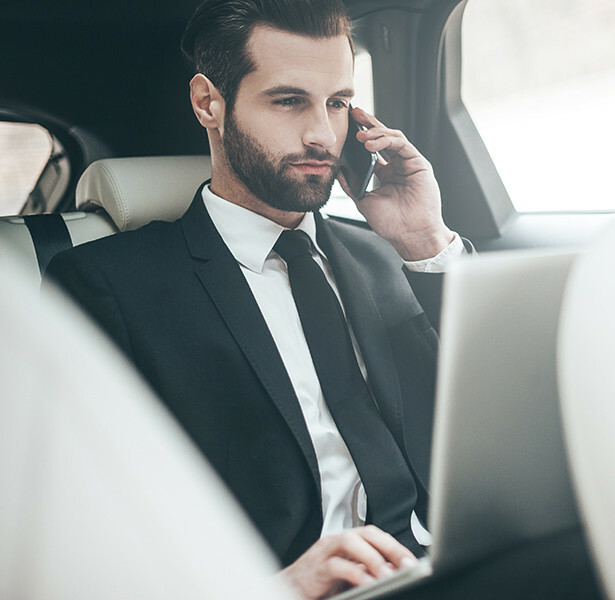 In the case of hosting business visits, renting a car with a driver will allow for greater visibility and prestige for your company. We also offer high-end vans for trips of up to 8 passengers. Carrying out good transfer management for business reasons, can lead to new opportunities to grow in a sector. The private driver service for congresses in Marbella offered by Anser Europe will help you to fulfil all the business objectives that you have in mind. Our car rental service with a driver for business trips in Marbella has maximum guarantees and professionalism. Prevention and organisation are essentials for many companies to get something so fundamental as business commitments to go as planned. Thanks to the car rental with a driver for professionals, it will offer you the opportunity to program the mobility and the transfer that you need, either to go to a meeting, congress or fair, or to pick up future investors or collaborators.